Taj Mahal stands in the city of Agra, in the north Indian state of Uttar Pradesh, on the banks of the Yamuna River. 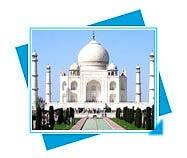 The history of Agra, the Taj Mahal India is one of the great love stories of the world. The Mughal Emperor Shah Jahan ruled from 1628 to 1658 and was married to Arjumand Bano Begum. He called his wife Mumtaz Mahal (Crown of the Palace), because she was so loved to him. Mumtaz Mahal and Shah Jahan had 14 children and the queen accompanied Shah Jahan everywhere. 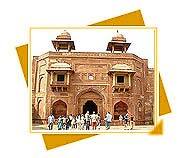 The history of Agra, the Taj Mahal tells us many mythology and facts associated with this wonderful structure. Mughal Emperor Shah Jahan Built the Taj Mahal in the remembrance of his beloved wife, Mumtaz Mahal. Mumtaz Mahal (Arjumand Bano Begum), an indivisible companion of Shah Jahan, died in 1631, while giving birth to their 14th child. Her dying wish to Shah Jahan was that he should construct a tomb in her remembrance such as the world had never seen before. The history of Agra, the Taj Mahal begins with Mumtaz Mahal's tragic end. It is thought that during her last moments, Mumtaz Mahal obtained a promise from Shah Jahan that he will build world's most beautiful tribute in her remembrance. But this has not been proven to be true, till date. However, Shah Jahan did certainly build a wonderful monument as a tribute to her wife, which we today know as the "Taj Mahal". Shah Jahan, himself also, lies entombed in this tomb along with his wife. The construction of Taj Mahal started in the year 1631 and it took just about 22 years to build it. 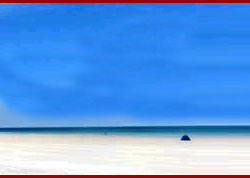 An essence of love, it made use of the services of 22,000 laborers and 1,000 elephants. It was built totally out of white marble, which was brought in from all over India and central Asia. After an expenditure of approximately 32 million rupees, The Taj Mahal was finally finished in the year 1653. However, the history of Agra Taj Mahal of India still has some gaps. Their real tombs are in an underground room of the Taj Mahal. The two ornamentally decorated tombs on the ground floor, protected by the dome of the Taj Mahal are part of the stylistic design of this beautiful monument in Agra India. The history of the Taj Mahal in Agra is a love story that transcends time and continues to be retold each day to the tourists who trip the Taj Mahal in Agra India. 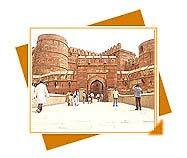 This was built by Akbar for his preferred son Jehangir to provide him with the soothe and luxury inside the fort. 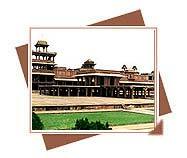 This palace displays an outstanding combination of Hindu and Muslim architecture.